A&T “Mobile" Truck Road Service will go just about anywhere for anything, at any time. At A&T “Mobile" Truck Road Service we like to think of ourselves as the “Ambulance Service for Trucks." If your truck is broken down, we will come to you and perform the necessary triage to get you back on the road. A&T now includes towing, load adjustments, and more. Below is a map that indicates our approximate service area. Our goal is to get to you within 1.3 hours and most often, on a clean run, we can be there in just under an hour. 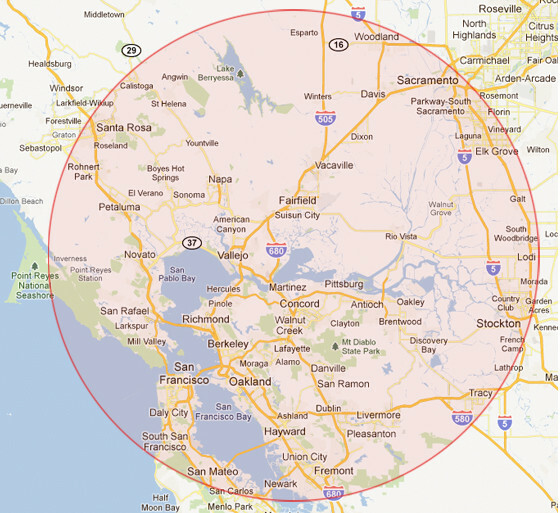 Although we have sometimes gone further than this circle–and we will still–this approximate 50-60 mile radius from our home base in Fairfield, CA is what we call our call area. Of course, most of our calls are probably within 25 miles and we get there even sooner, but rest assured that we will do everything within our power to be there as quickly as possible because when your truck is down, time is very important. We are centrally located in Fairfield CA which is approximately 45 miles from San Francisco or Sacramento and about 50 miles from Stockton. We regularly service Fairfield, Vallejo, Rio Vista, Napa, Vacaville, Travis AFB, Winters, Dixon, Davis, Benicia, St. Helena, Calistoga, Suisun City, Green Valley, Crockett, Hercules, San Pablo, Richmond, Concord, Walnut Creek, Martinez, Boyes Hot Springs, Sonoma, Allendale, Cordelia, Pleasant Hill, Pittsburg, Antioch, Novato, American Canyon, Truck Scales and much more. We’ve even gone as far as San Jose, the South Bay and the Peninsula because we always answer the phone 24 hours a day, 7 days a week. Solano County is our home turf, but readily service Napa County, Yolo County, Contra Costa County, Sonoma County, Sacramento County, and San Joaquin County, Alameda County and Marin County. We also have been known to travel to San Francisco County, Santa Clara County and San Mateo County. In fact, if you need immediate service, we will travel where ever we need to in order to take care of your problem. We are at your service and we mean that sincerely.